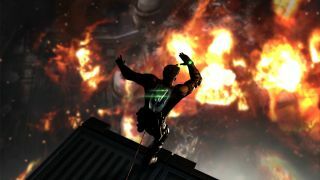 Despite criticisms being thrown at the Wii U version of Tom Clancy's Splinter Cell: Blacklist over its lack of offline multiplayer, the game's Creative Director told us that the technology of Nintendo's console means it will still be offering the most immersive experience. Maxime Béland, who has been working with the Ubisoft team on Blacklist for the past three years, told TechRadar that during development the team found that the Wii U's GamePad features made for a natural pairing with the game, rather than leaving the team having to invent tapped-on functions to support the hardware. "I like it because it feels like it's a natural evolution," said Béland on putting the game on Nintendo's console. "We weren't inventing features to support the gamepad, we were embracing the features we already had in supporting the gamepad." "For us it was interesting because Sam [Fisher] has that gamepad in a way. So when Sam snake cams under a door to see what's under the other side, while he's looking at the feed of his snake cam, you're looking at the gamepad. You can tap to mark the enemies on the pad." "It's not gimmicky, it makes sense," he added. "It's natural and it feels good." As for whether the Xbox One's and, to a slightly lesser extent the PS4's, emphasis on motion gaming will ever take see Sam Fisher drop the controller, Béland still isn't convinced. "I believe in using all these things when they make sense," he said. "Sitting on your couch with two hands on the controller, that hasn't changed since it was invented"
Béland added: "In the short term anyway, I think there's this type of game where you're sitting on your couch with both hands on the controller". It's shaping up to be a busy August for Ubisoft, with both Splinter Cell: Blacklist and Rayman Legends launching this month.